Another major foundation with the support of Junkers was the establishment of Sudwestdeutsche Luftverkehrs AG at Frankfurt. This airline was founded on July, 2nd 1924 by Junkers and industrials, as well as by the city of Frankfurt with an initial stock capital of 400.000 RM. One of the major missions of this new organisation was the development of the Frankfurt airport, which was located at Rebstock since 1910. Frankfurt's major Ludwig Landmann supported the extension of the Rebstock area as an airfield in 1924 and Suedwestdeutsche Luftverkehrs A.G. was responsible for that work. From Rebstock Sudwestdeutsche Luftverkehrs AG also started operations via Nuremberg to Munich and connected the Frankfurt area with the Transeuropa network. In 1925 four F13 aircraft were delivered to SWL by Junkers and a G24 followed the same year. When Junkers Luftverkehr was integrated into Deutsche Luft Hansa, the operational part of SWL also was taken over by Luft Hansa. SWL on the other hand took shares of Luft Hansa for the transfer of the operational unit. On the other hand Luft Hansa got 11.7% of the SWL shares, which formerly belonged to Junkers. SWL itself did not only remain as a shareholding organisation but also as an airport operator of the Frankfurt airport. 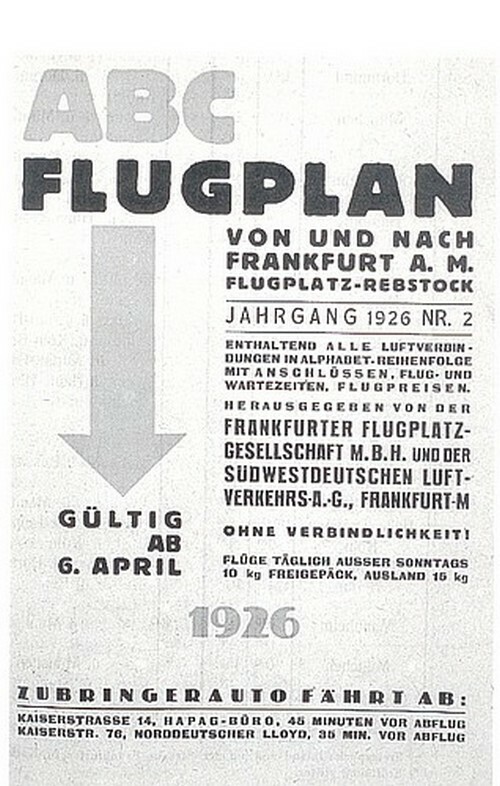 It was responsible for the management of the Frankfurt airfield and in 1936 SWL became the operator of the new Rhein-Main Airfield at Frankfurt's City Forrest South of Frankfurt. After WWII the company was refounded as Verkehrsaktiengesellschaft Rhein-Main in 1947 and in 1954 it was renamed into Flughafen Frankfurt/Main. In 2001 the name was changed again into FRAPORT A.G..